When you just want to relax & indulge in something rich and satisfying, I can't think of anything more blithe than a brownie (or three...who's counting?). Especially when the brownie is laced with peanut butter. Dark chocolate + peanut butter are savagely deadly - Bonnie and Clyde of the confectionery world. Lethal, dangerous and undeniably irresistible. I would mar my perfect record and do time for these brownies. Brownies; preheat oven to 325 degrees. Line an 8-inch square baking pan with foil, allowing a 2-inch overhang. Spray the foil and set aside. Prepare the batter: Put butter and chocolates in a heatproof medium bowl set over a pan of simmering water; stir until melted. Let cool slightly. Whisk together flour, baking powder, and salt in a bowl. Whisk granulated sugar and espresso powder into chocolate mixture. Add eggs, one at a time, and whisk until mixture is smooth. Stir in vanilla. Add flour mixture; stir until well incorporated. Set aside while you make the filling. Filling; in a large bowl, on low speed, beat together the butter, confectioners' sugar, peanut butter, maple syrup, and salt until smooth. Pour about one-third of batter into prepared pan; spread evenly with a rubber spatula. Drop dollops of peanut butter filling (about 1 tablespoon each) on top of batter, spacing about 1 inch apart. Drizzle remaining batter on top, and gently spread to fill pan. Drop dollops of remaining filling on top. Gently swirl peanut butter filling into batter with a butter knife, running the knife lengthwise and crosswise through layers. Bake until a cake tester inserted into brownies (avoid center and edges) comes out with a few crumbs but is not wet, about 45 minutes. Let cool slightly in pan, about 15 minutes. Using the foil overhang, carefully lift the brownies out of the pan and place on a wire rack. Cool completely before ganaching. Ganache; put chocolate chips into a medium-size heatproof bowl. In a small saucepan, bring cream to a gentle boil. Pour the hot cream over chocolate chips and let mixture stand for about 5 minutes. Using small concentric circles, gently whisk in butter until it is incorporated, chocolate is melted, and a smooth mixture forms. Pour/spread the ganache on cooled brownies and let stand until set, about 20 minutes. That combo is awesome! 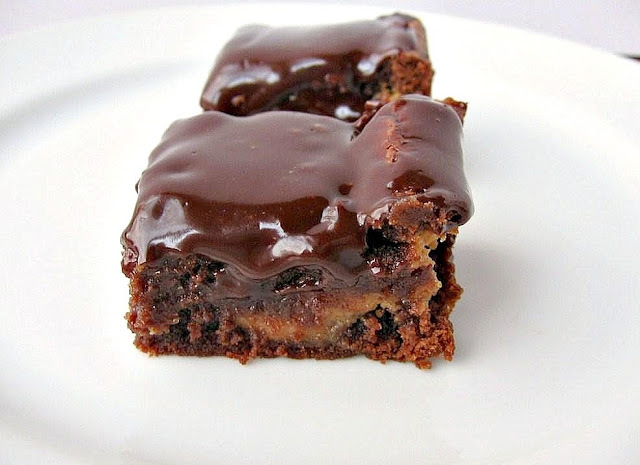 Your brownies are irresistibly fudgy. These are just lethally incrediblicious. Wow. These brownies are skipping to the top of my "to try" list!! Yum, Valerie, I haven't had a good brownie for so long. These look delicious, and I agree about peanut butter and chocolate being the Bonnie & Clyde of the confectionary world. Yum! these look delicious! i love peanut butter with chocolate and maple sounds like a great addition! Oh, wow! I so want one of these right now, but I'll have to settle for cereal and coffee. I love chocolate and peanut butter together, and maple is in my blood. Yum! Going to check out your spotlight on the Club Northwestern site--that's so exciting. You consistently post the most amazing recipes on your blog, and this one is no different. I can't wait to see my family's jaws drop when I serve them these brownies! Absolutely stunning.Our North American obsession with peanut butter is unique to the rest of the world, and they never seem to understand it. It is difficult for me to understand how they don't become as hooked as we are once they taste the concoctions created with peanut butter - like this one... I can only imagine how delicious it is. Anymore, with all of the allergies regarding peanuts, I am every so careful about baking with them or taking them out anywhere. Such a shame... both ways. Sweet gooey goodness! These look incredible. A delicious flavour combination and photos that make me drool! Holy moistness! 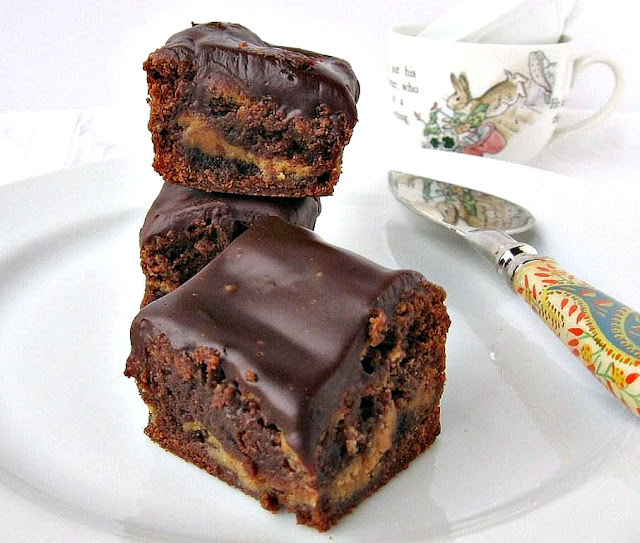 That second picture is just brownie perfection - especially with that thick, thick layer of ganache! How could you print this recipe or show those photos? I want to run to the kitchen to make them NOW in the middle of the night. I have printed the recipe and hopefully will get these baked very soon. Those brownies look amazing!! I just saw the Northwestern site, and only now have I finally understood your obsession with wanting to work there. It look awesome. Hope you get it, now that you're getting noticed by them! How am I supposed to wait for the brownies to completely cool to ganache them and NOM?